Microbiology offers a unique understanding of the variation and adaption of organisms right in your classroom. Microbiology is also a key method used in industry and environmental sciences to detect and evaluate biological risks. Download full list of descriptions of bacteria. Petri dish, sterile, 90 mm x 14 mm. Vented, polystyrene. 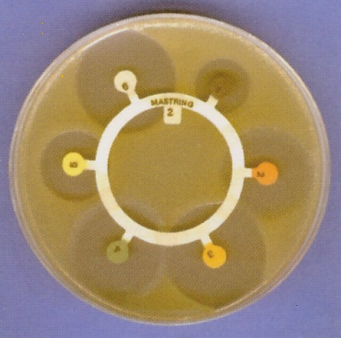 Mastring-S™ M5 is a ring device of antibiotic susceptibility discs for the convenient and simple simultaneous testing of the sensitivity of any bacterial strain to the following antibiotics- Ampicillin, Chloramphenicol, Penicillin G, Streptomycin, Sulphatriad and Tetracycline. These gamma sterile inoculation loops are flexible to facilitate uniform and smooth streaking without damaging the gel surface. They are also rigid enough to enable accurate selection of single colonies. Disposable polystyrene "L" shaped culture spreader. Sterile. Oval Glass Bottle suitable for sterilising media or growing cultures. These bottles are supplied with an autoclavable polypropylene lid.